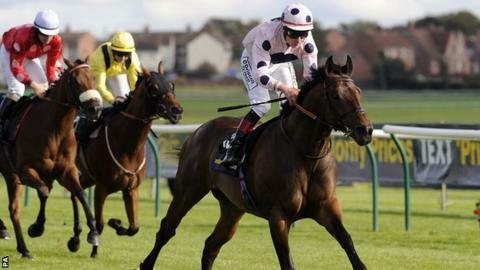 Captain Ramius romped to victory by two-and-a-half lengths in the Ayr Gold Cup as trainer Kevin Ryan triumphed for the second successive year. The 16-1 shot, ridden by Irish jockey Pat Smullen, stormed home from a furlong out to win Europe's richest sprint handicap, worth £120,000. Regal Parade, the 2008 winner, was second with 8-1 favourite Maarek a further length back in third. Sholaan had led the field early on before dropping back to finish fourth. North Yorkshire trainer Ryan, who had previously won this race with Advanced in 2007 and Our Jonathan last year, said: "I'm delighted as we had four good horses going into the race. "After the Bunbury Cup [in July] I said to Clodagh [McStay, owner] I was going to train him for the Ayr Gold Cup. "We start thinking about this race in January and when it comes off it's great." Smullen was riding for the first time at Ayr and was delighted with his victory. "It's an honour to win the Ayr Gold Cup," he said. "I'm thrilled." Jim Goldie's home hope, Hawkeyethenoo, finished 13th with the Ian Semple-trained Cheviot 26th and last. However, Goldie lifted the William Hill Ayr Bronze Cup as 5-1 favourite Jack Dexter stayed on strongly under Graham Lee to beat 22 rivals in impressive fashion. Uplawmoor-based trainer Goldie also bred Jack Dexter and the three-year-old is owned by the Jim Goldie Racing Club. Mass Rally (16-1) produced a storming finish under jockey Paul Mulrennan to beat the 6-1 fav Highland Colori by a short-head in a thrilling finale to the William Hill Ayr Silver Cup. Mulrennan sealed a memorable 75-1 brace on Melody of Love (7-2) in the Group 3 Firth of Clyde Stakes at the Craigie track.